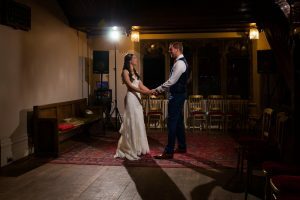 We first visited Hargate Hall two weeks after getting engaged and straight away fell in love with it. 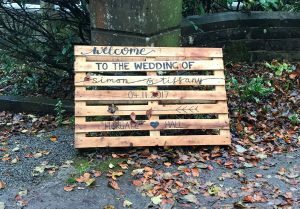 We already loved the idea of a DIY wedding at a place where all our guests could stay, but after meeting Anthony we knew that Hargate was exactly the right venue for us. The location, beautiful house and grounds, and helpful hosts made it an easy decision! The whole process was so simple and easy, and throughout it all Anthony & Julie were on hand to answer all questions whenever we needed. The community of Hargate couples past, present and future is so wonderful. Through access to the Facebook group it was great to see what other people have done previously. It helped work out some of those practical details that you can only understand if you’ve been through it yourself. 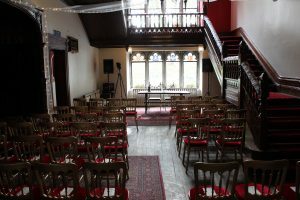 Hargate Hall is such a wonderfully unique DIY wedding venue. Being able to have our friends and family together for a weekend was such a joy. Everyone who attended our wedding commented on what a fantastic idea it was and we all felt right at home straight away. Everything was provided for in the apartments. The freedom to do our own thing meant that our Wedding Day was everything we could’ve asked for and more, suiting our personalities and relationship perfectly. Getting set up on the Friday before our wedding was so simple, and Tabby from Mode For… Events – one of the recommended caterers/organisers – helped us immensely with her expertise and knowledge of the venue. Filling the empty hall with our decorations and personal touches made the wedding really feel like a communal event. As guests arrived, they helped to unpack boxes and supermarket deliveries. Everyone mucking in meant that by the time the ceremony came around on the Saturday they’d all made friend. People from different circles connected beforehand which eliminated that typical wedding awkwardness. 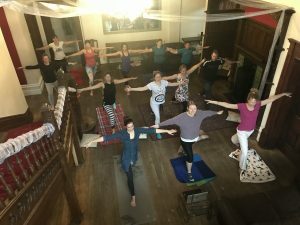 We even fitted in some Yoga in the morning! We chose to have the whole event in the main hall rather than using the marquee. On a cold November day it was such a good decision to keep things cosy in one place. Walking down those stairs (to Jurassic Park!) Tiffany was overwhelmed to see everyone’s smiling facings from below, and our dinner of pie & mash carried on the rustic pub feel we were going for. We were lucky to have a relatively clear day so we could make the most of the gorgeous grounds for our photos. Our photographer Ben Pollard also set up an atmospheric shot that evening with the rain illuminating the house. 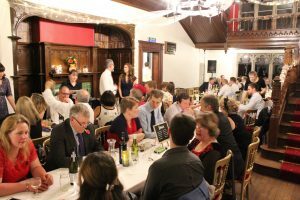 Throughout our engagement and planning, we never once doubted our choice of Hargate Hall. We knew that whatever we wanted to do (just about!) was totally okay and we could really make the day our own. It resulted in a day we’ll never forget, and that our guests will hopefully remember forever too!